Canada may have hit the news lately over its absurd liquor laws, but it’s not the only country to force its residents to jump through hoops in the name of a decent dram. From drinking permits to the Zion Curtain, Matt Evans examines the world’s weirdest whisky laws. Bars in British Columbia, Canada, were thrown back into an era of Untouchables-esque turbulence last month. Led by Canadian government agents, three whisky bars and a private members club were raided by police, who confiscated hundreds of bottles that were legally acquired but, bizarrely, being sold on illegally. For many, the raids highlighted the absurdity of some Canadian provinces’ byzantine rules, which can have far-reaching implications. At the Victoria Whisky Festival that same weekend, many brands were intimidated into leaving bottles tightly sealed, for fear of breaching the law by serving drinks illegally. But Canada is not the only country clamping down on the sale of spirits. Scour the length and breadth of different local and national laws and the adventurous drinker will soon find severe, and often strange, liquor legislation enforced. You’ll soon appreciate how easy it is to get a good dram in your home town once you discover the hoops others have to jump through for a drink. The ability individual US states have to dictate their own liquor laws has turned the US into a patchwork of confusing, conflicting messages. Take Texas, for instance – the Lone Star State determines that alcohol can only be sold in a ‘package store’ – independent liquor stores with licences handed out by the government. Licences are not issued to publicly-owned companies, resulting in an infamous ongoing legal dispute with supermarket chain Walmart, which is forbidden from stocking hard liquor. The idea of government-owned stores goes one step further in Sweden. Any beverage with an alcohol content higher than 3.5% abv may only be purchased from the State-owned chain of shops, Systembolaget, which stocks a pre-approved list of beverages. The system gives the government greater control over the responsible sale of alcohol – discounts such as buy-one-get-one-free are prohibited – and a direct source of tax, which is the third-highest in the EU. The strict law also means that Swedish vineyards, breweries and distilleries may not sell their own products to visitors. They even extend to boats sailing on Swedish waters, which cannot sell alcohol to passengers. However, canny Swedes are getting around the rules by participating in ‘whisky cruises’, which sail into international waters to sell expressions not available through Systembolaget. Finland has a similar, State-owned monopoly chain called Alko, although the limit on commercial sale of beer outside the chain has recently been raised to 5.5% abv, a sign that the law may finally be loosening. Although its iron fist on the liquor industry is beginning to relax, Finland’s strict regulations have caused a ruckus before. In 2014, the Beer and Whisky Expo Finland was forced to undergo a name change to remove the word ‘whisky’, due to laws preventing the advertisement of strong alcoholic drinks. The regulations are so strict, in fact, that under Finnish law distilleries are prevented from allowing investors, customers, family or friends from tasting their products privately, even in a closed, invitation-only environment, as it’s considered illegal promotion. All stock must be sold through the proper channels. Chances are that you’ve heard this one, as it’s sometimes plastered over Jack Daniel’s enormous ad campaign posters. Despite being the home of the world’s best-selling American whiskey brand, punters are unable to legally buy alcohol in the town where it’s made. The reason? Lynchburg is part of Moore, a county famously still dry long after Prohibition was repealed in 1933. Worry not: distillery visitors can still purchase a bottle of JD from the distillery (and taste a few sips on the tour) thanks to a legal loophole: buy a bottle, and they’ll give you the whiskey free. Most distillery visitors make the pilgrimage to understand more about whisky and, more importantly, to enjoy the tour. Unreasonable? Perhaps, according to new Alaskan legislation enacted only last week. The law is closely scrutinised regarding what’s permitted at distilleries — on-site consumption of the distillery’s product is permitted, but serving with a mixer is forbidden, forcing customers to buy their cola separately. Utah’s most famous pernickety drinking law was the Zion Curtain, a reference to the state’s large Mormon population. As bartenders were not permitted to be seen by minors while mixing drinks, a pane of frosted glass would separate staff from patrons in every bar in the state. But, after a sweeping piece of legislative reform in March 2017, restaurants can be reviewed and have their curtains removed on a case-by-case basis. Now minors are simply not allowed within 10 feet of the bar. Another notable Utah-specific law is that all liquors are ‘meter-dispensed’, which means that only 1.5oz (42ml) of liquor can be used in a mixed drink. No double measures after a hard day’s work, and certainly no Long Island Iced Teas. India’s appetite for whisky is growing. A study from beverage analyst the IWSR claims that India is poised to be a key driver of the whisky market for the next five years, and despite certain states in the country remaining dry for years, nowhere is whisky more in demand than in some of India’s urban hubs (although it should be noted that much Indian whisky does not conform to the legal definition of the term in the EU and the US). But, thanks to the Bombay Prohibition Act 1949, it’s illegal to drink in the state of Maharashtra, including one of India’s busiest cities, Mumbai, without obtaining a permit from the local government. The upside is that it’s not terribly well-enforced as long as the drinking is confined to bars and clubs. However, with liquor permits available to purchase at Mumbai Airport as you land, they’re easy to get hold of and likely to be worth obtaining should you fancy a dram during your stay. More red tape abounds in British Columbia that further limits the types of drinks bartenders can serve. Once a bar buys a bottle of whisky – or any other spirit for that matter – surely it’s theirs to serve as they please? Not according to the Liquor Control and Licensing Branch of British Columbia, which has placed a ban on the sale of barrel-aged, or home-infused, liquors in bars. 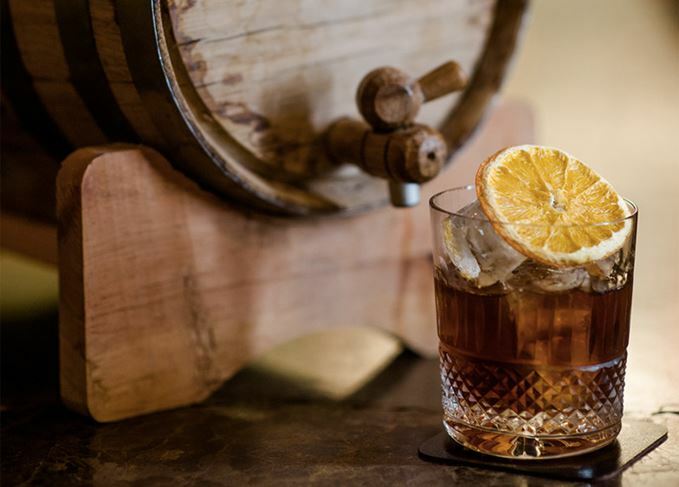 Many of the best bartenders in the world experiment with barrel ageing to breathe new life into traditional favourites such as the Old Fashioned, while more practical bar staff view it as a convenient way to infuse and store pre-mixed cocktails. Unfortunately, BC law states that alcohol should not be tampered with, although the Liquor Control and Licensing Branch is also reportedly reviewing the regulations. The American whiskey has overtaken The Famous Grouse as the UK’s most lucrative whisky in retail.